Fondis have tested their stoves across a range of chimney heights to allow you to accurately choose the optimum flue diameter. The stoves are first tested at the minimum flue diameter, usually 180mm, at a designated chimney height. However Fondis stoves are supplied with an oversize flue spigot which allows the flue diameter to be increased to 200mm or 230mm and so enables the stove to be installed on a shorter chimney and still get the correct draw. 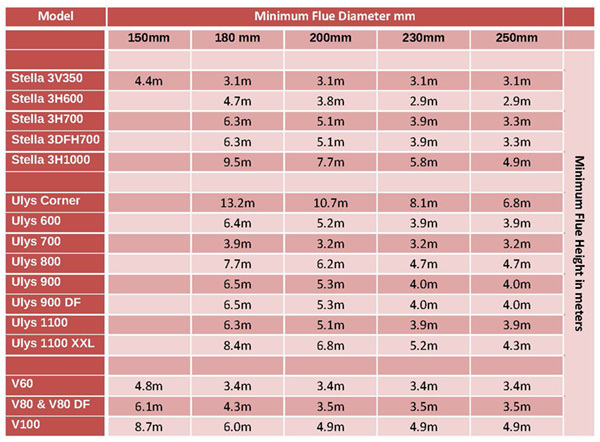 The chart below indicates which size should be used to match which chimney height. Enabling the flue size to be matched to different chimney heights overcomes the problem of over-drawing and so ensures that every Fondis stove operates at maximum efficiency whatever the chimney height.